Jewish foodies rejoice! Those who follow the mitzvah of kashrut – as well as those who simply follow their hearts to healthy options – will find more to love this summer in street fare now catering to the eclectic tastes of Jewish Detroit. 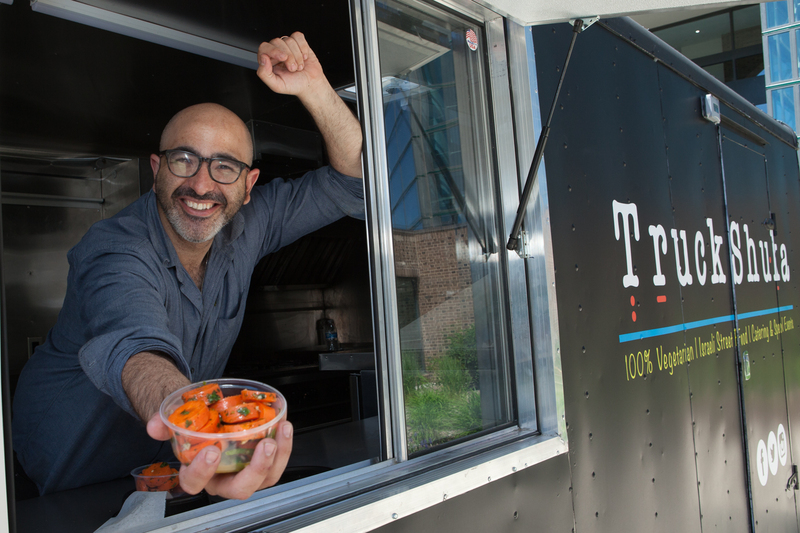 Hot on the trail for falafel and “fries-tried-and-true,” new fusion deli treats and fresh bounties of local greens, the food truck scene is picking up steam in the burbs and popping up downtown. 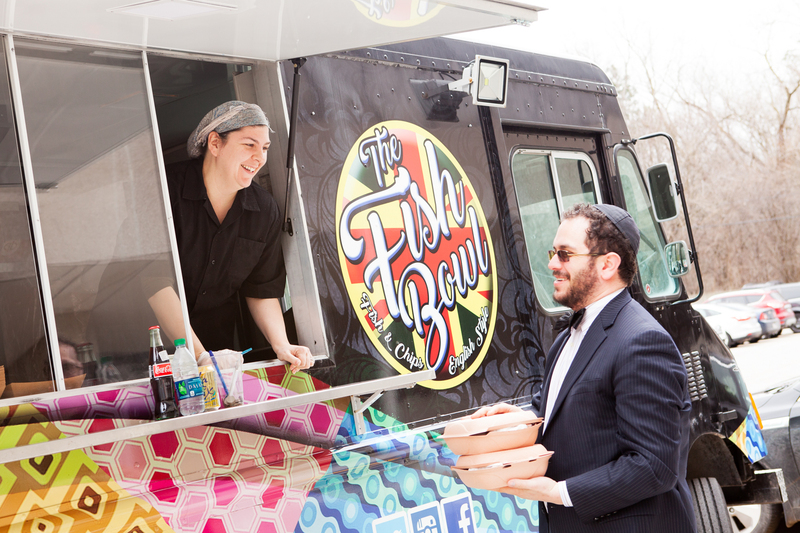 To sample or savor, we offer a foretaste of six newish and Jewish eateries on wheels . 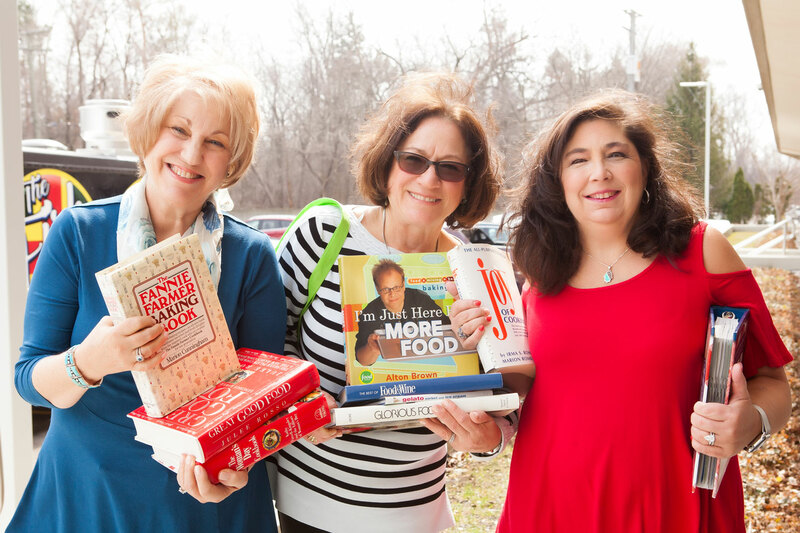 . . all heading to the 2017 Michigan Jewish Food Festival, presented by Hazon Detroit, Sunday, August 27. Hit The Spot for falafels. Or the Fish Bowl for fish and chips. 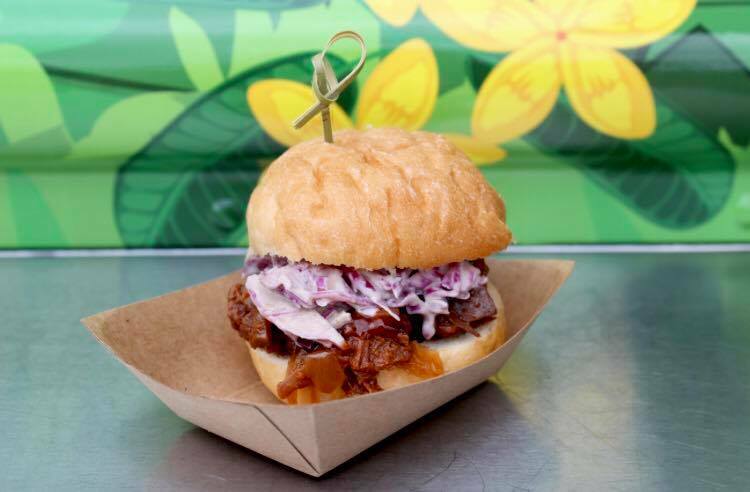 Detroit’s only kosher food truck comes ’round with two distinct menus and theme dinners, too. Established: 2016. From kosher catering and a food stand hitting the spot at Campus Martius, Cari is now on the move, following her dream of a venue on wheels. Certified Glatt Kosher, The Spot is the only kosher food truck in Michigan and a one-of-a-kind in the Midwest. On the Menu: “Fresh, Lively and for the People” Those are Cari’s words for her trademark falafels and fries, shawarma, hummus and salads on board The Spot. Yummy sandwiches, soups and desserts. What a way to go vegan! This is The Nosh Pit. Must-Try: “The Karen”- grilled cheese with sweet roasted red peppers, house-made tangy vegan aioli, homemade vegan pesto with either sharp cheddar or vegan cheese. Served on fresh-made kosher rye. Or “The Larry” corned beet Reuben. 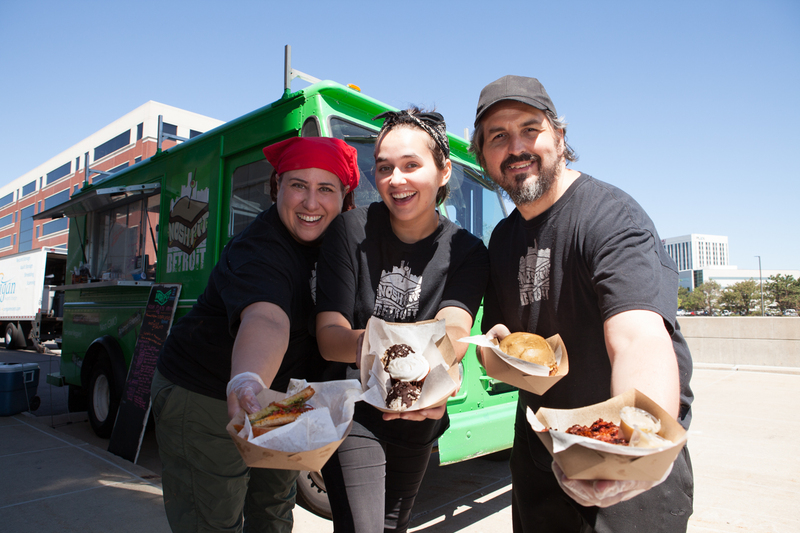 @ the Jewish Food Festival: Get ready for Nosh Pit’s version of “old-school Jewish favorites” – latkes, veggie burgers and macaroons, just like the ones you get at Passover. TruckShuka! Jewish Detroit’s new food truck on the block! Shown here: Chef Benji in Southfield on a sell-out day. Established: January 2017. Born and raised in Jerusalem, Jewish Detroit’s newest food truck entrepreneur spent 10 years in New York working in real estate, cooking meals on the side for groups of 20 to 30 friends at a time. Last year, Benji and his wife, Jessica Blake (an attorney, originally from Huntington Woods), made the move to Detroit. After a brief stint at the Russell Street Deli in the Eastern Market, Benji bought a truck, determined to set off on his own. Must-Try: Shakshuka – a hearty, savory meal, served in a half-loaf of bread with poached egg and spicy tomato sauce or a specialty green version made out of asparagus, spinach, onions, mushroom. For dessert: Melt-in-your-mouth tahini chocolate chip cookies. @the Jewish Food Festival: Celebrating Israel, cooking for a hungry crowd, Benji plans to turn up the heat and volume from his truck, and perhaps even play Israeli music for dancing in the street! 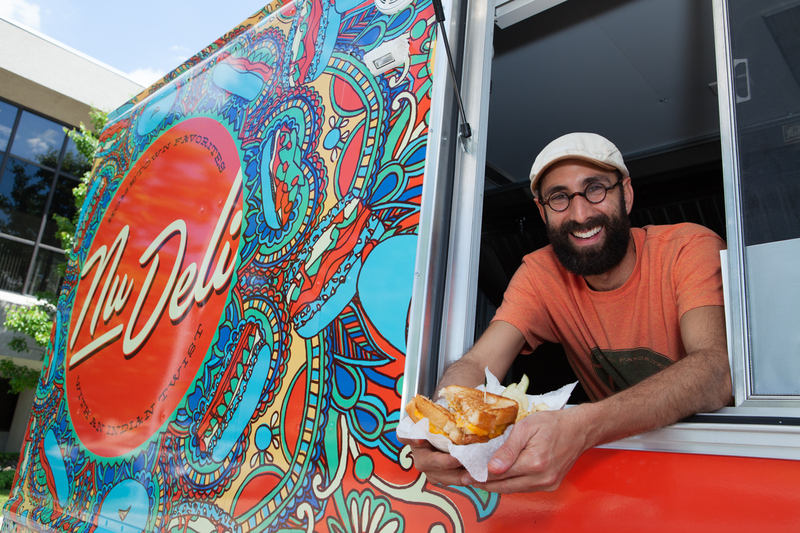 Nu Deli’s Matt Daniel is a graphic designer and everything about his truck and the menu shows off his creativity. Established: July 2016. “Rainbirds” from Mumbai, India, Matt and his partner, Meghana, opened a seasonal beach resort restaurant two years ago in Goa. 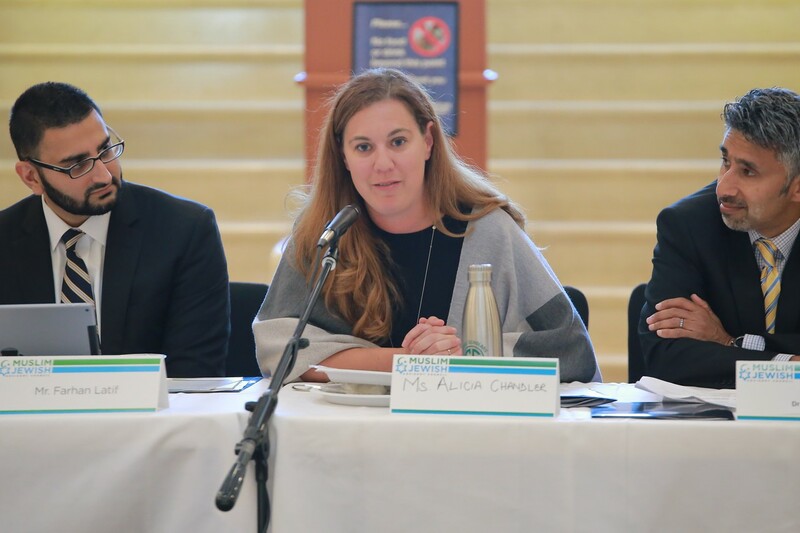 “It so happens during monsoon season and in India, the weather is beautiful in Michigan – perfect for a second seasonal venue” says Matt, a Southfield native, with family living in town. “I considered going back to my day job as a graphic designer in Mumbai, but instead started up Nu Deli with my mother, Ruth, who always had the fantasy of running a restaurant of her own, so now our plans mesh perfectly together. Must-Try: The Nu Grilled Cheese with a tangy mango chutney and house flavored chips. Mom’s Cheese Cupcake of the Day. Or the super smooth Iced Chai. 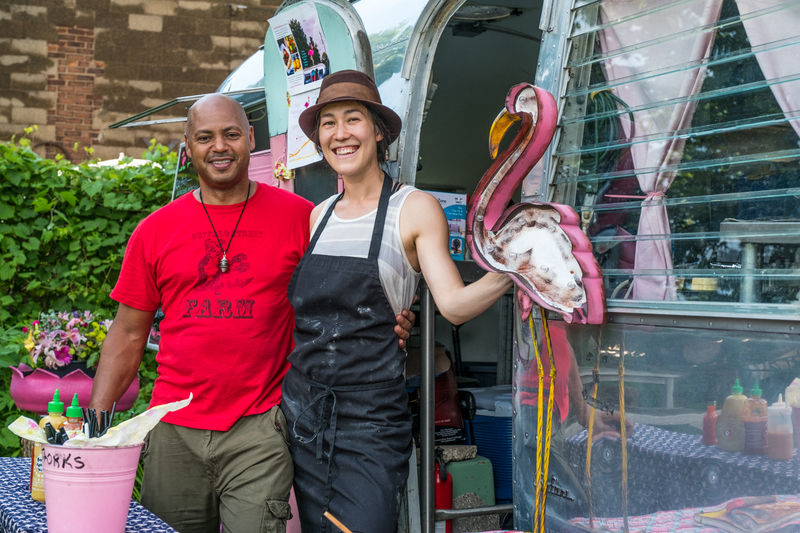 Khalee Givens and Meiko Krishok, with Pink Flamingo , their vintage Airstream trailer, all set and ready to serve pop-up picnics in the park. Established: July 2012. The Pink Flamingo is a 1958 Airstream trailer mobile restaurant serving farm-to-table meals every Thursday from 6 to 10 pm in the community garden in North Corktown. Pop-up brunches and dinners, personal chef work and catering and workshops available. @the Jewish Food Festival: Just look for the pink flamingos among tables and umbrellas, set up pop-up restaurant-style for a relaxed vibe where people can meet, eat, drink and enjoy. Established: 2015. 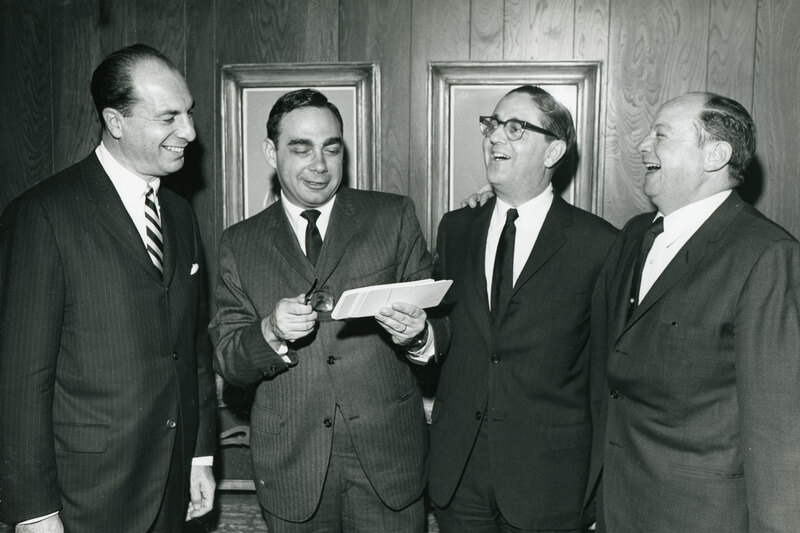 Founder, Joel Kahn, MD, knows some­thing about health. As an acclaimed car­di­ol­o­gist and author, he cham­pi­ons food as med­i­cine and has devot­ed his career to edu­cat­ing oth­ers about the heal­ing pow­er of plants. 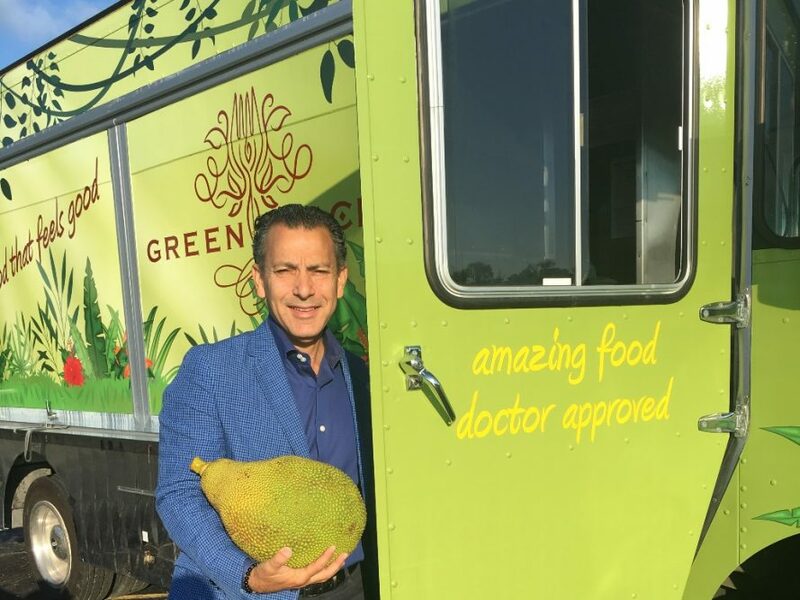 With the help of his wife, Karen, and son, Daniel, Dr. Kahn decid­ed to turn his words into action and pio­neer a ful­ly veg­an, plant-based bar and eatery in Ferndale . . . and now a second venue on wheels. 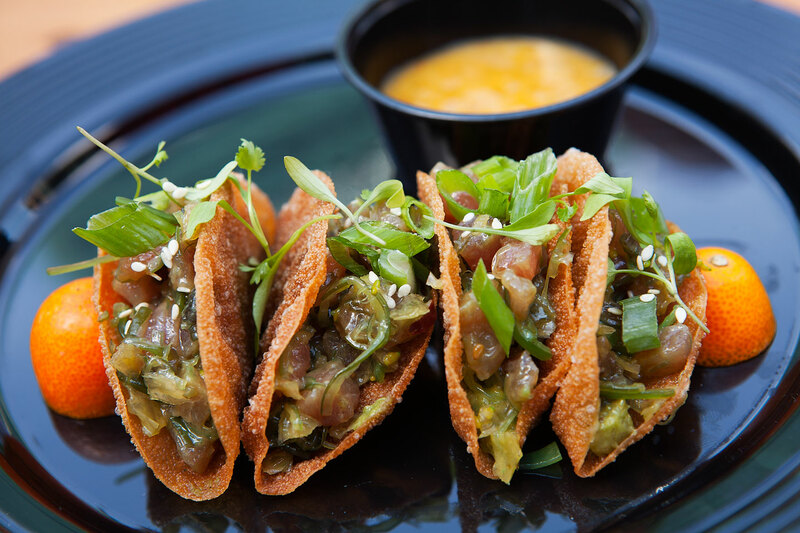 On the Menu: A colorful, plant-based daily selection with an extensive list of gluten-free, soy-free, nut-free, and oil-free dishes. Coming to the Jewish Food Festival: Offering more scrumptious and healthy choices than ever!